A look at what I would buy for Day 12 of the Style Challenge. The look was to include: gray denim, sweatshirt (like this fun fuzzy one), short booties, and black handbag. I swapped out a sweater for the sweatshirt and gray cords for the denim. I added the leopard coat because I really liked this leopard coat I found at H&M and I wanted to share it. It is a great price and perfect way to bring the whole look together. 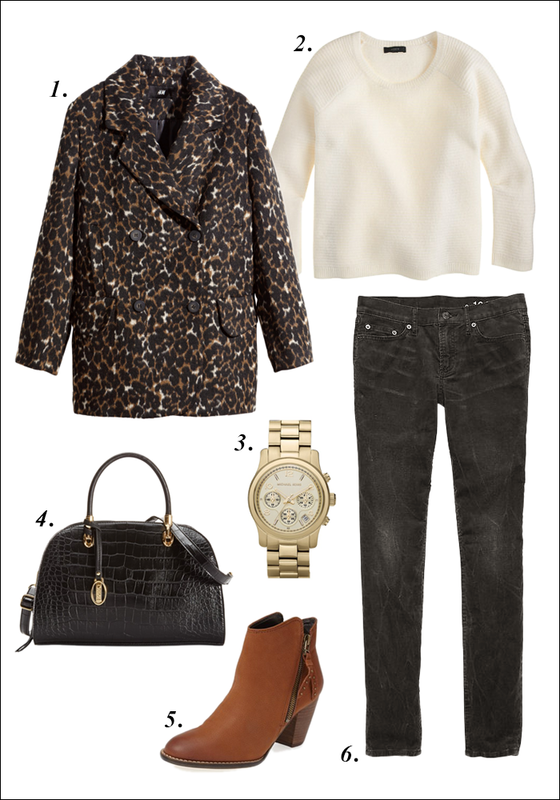 If you like leopard print, and have been a little hesitant to give it a try, I recommend trying to introduce it through accessories (like a scarf or belt) or shoes or go for the jacket! I don't think you will regret it. A look back at Day One / Six / Nine of the Fall Style Challenge. Follow along on Facebook for the latest finds (and great sale deals)! Love the H&M jacket. Great price and looks great with the booties! I really like this casual set and It is a lovely outfit the one you've created. LOVE that coat! So fun!